ArtCursors allows you to find and extract cursors, create and edit cursors, import and export cursors and manage cursor libraries. With this software download you can create and edit static and animated cursors with color depths up to 32-bit Ttue Color. ArtCursors contains different paint tools, including enhanced gradient fills. You can import cursors from image, icon and library files and from executables. 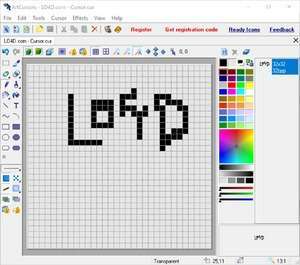 ArtCursors 5.28 is a shareware program and can be used as a demo to try the software until the free trial period has ended. A full version of the program is available after the trial period ends. For security reasons, you should also check out the ArtCursors download at LO4D.com which includes virus and malware tests. Additional screenshots of this application download may be available, too.